E-book consumers are decidedly shifting to multi-function tablets and away from dedicated e-readers, according to the Book Industry Study Group (BISG)’s closely watched on-going Consumer Attitudes Toward E-Book Reading survey. The fourth and final installment in Volume Three of the Bowker-powered survey shows that tablets have risen by about 25 percent over the past year as the first choice for respondents’ e-reading device, while dedicated e-readers have fallen by the same amount. The rise of tablet popularity has been fueled largely by Amazon’s Kindle Fire, which increased over the past year from no use to be the first choice for more than 17 percent of e-book consumers. Other Android devices, such as Barnes & Noble’s NOOK Tablet, have also increased as the first choice for respondents’ e-reading device, from two percent in August 2011 to nearly seven percent in August 2012, while Apple’s iPad has held steady around 10 percent. Power Buyers – those who purchase e-books at least weekly – are rapidly increasing their preference for tablets as e-reading devices. More than 38 percent indicated that tablets are their primary e-reading device, compared with about 19 percent a year ago. Dedicated e-readers are preferred by less than half of Power Buyers today, compared with more than two thirds last year. Further, tablets designed specifically for the purchase and consumption of books excel when it comes to that activity, but underperform for all others—sometimes by wide margins. Almost 60 percent of respondents who currently own Amazon’s Kindle Fire report that they read e-books “very often,” compared with 50 percent of those who currently own an Apple iPad. The two most common activities reportedly performed “very often” by iPad owners are Web browsing (60 percent) and creating or reading emails or text messages (59 percent). Kindle Fire owners report those activities at 30 percent and 25 percent, respectively. BISG’s Consumer Attitudes Toward E-Book Reading survey also looks at genre preferences, revealing that nonfiction genres, notably how-to guides/manuals and scientific/medical/technical titles, are generally preferred by respondents who read e-books on desktop, laptop, or netbook computers. 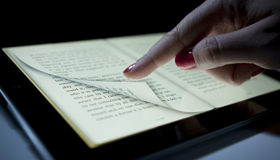 “This possibly suggests the need to improve e-reading device capabilities for non-linear e-book content,” said Jo Henry, Global Director of Bowker Market Research. Since November 2009, Consumer Attitudes Toward E-Book Reading has been tracking the habits and preferences of print book consumers who say they have acquired an e-book or a dedicated e-reading device within the past year. Volume Three is sponsored by Baker & Taylor, Barnes & Noble, and Harlequin. In addition to quarterly PDF Summary Reports, Volume Three of Consumer Attitudes Toward E-Book Reading is published as a dynamic online report via Real-Time Reporting: a unique web-based tool set displaying the raw data derived from responses – drillable, sortable with on-demand accessibility. Data for Consumer Attitudes Toward E-Book Reading was derived from a nationally representative panel of book consumers (men, women, and teens). Each month a new group of more than 6,000 respondents complete surveys about their book purchasing behavior for Bowker Market Research. Out of nearly 65,000 possible panelists, respondents were qualified for the BISG e-book survey by selecting “Digital/E book” as a binding type of a book they had acquired or indicating that they owned a dedicated e-reader device (such as Kindle, NOOK, or Sony Reader) during any month in 2012. This process yielded a survey sample of more than 1,000 e-book consumers.